The stone tower situated on the hill at Garreg, just under a mile west of Whitford is another one of those structures on the Mostyn estate that is shrouded in mystery. It has been suggested that this tower was a Roman Pharos, a lighthouse and even a windmill. Nevertheless, in the 1960s the historian George Lloyd put forward the theory that it was a 17th century beacon watchtower, erected by Sir Roger Mostyn (c.1568-1642) on his own land to watch out for pirates and invasions from Catholic Ireland and Spain. The tower’s elevated position certainly provides commanding views of the surrounding countryside, the Dee Estuary and coastlines as far as the Isle of Man. 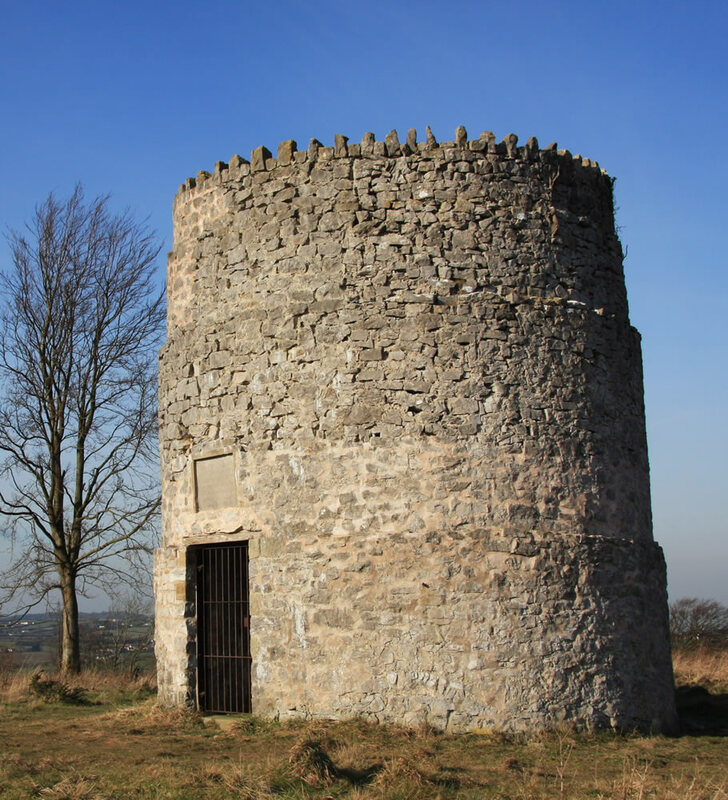 Similarly, in his positions as Sheriff, Justice of the Peace and Deputy Lieutenant of Flintshire, Sir Roger Mostyn was continually instructed to ‘keep the beacons in good repair’. In George Lloyd’s interpretation, the Garreg watchtower was just one in a long line of similar structures stretching across the north Wales coast. In relation to Sir Roger Mostyn’s landholdings and administrative duties around the Creuddyn Peninsula, it is interesting to note that a similar structure was also erected at Deganwy, with two intermediary towers at Abergele and at Llandrillo-yn-Rhos church. Each of the towers would have been manned to alert the surrounding countryside by smoke or flame should danger be imminent. Similarly, in this manner the towers could alert one another, forming an innovative line of communication running along the coastline of north Wales.